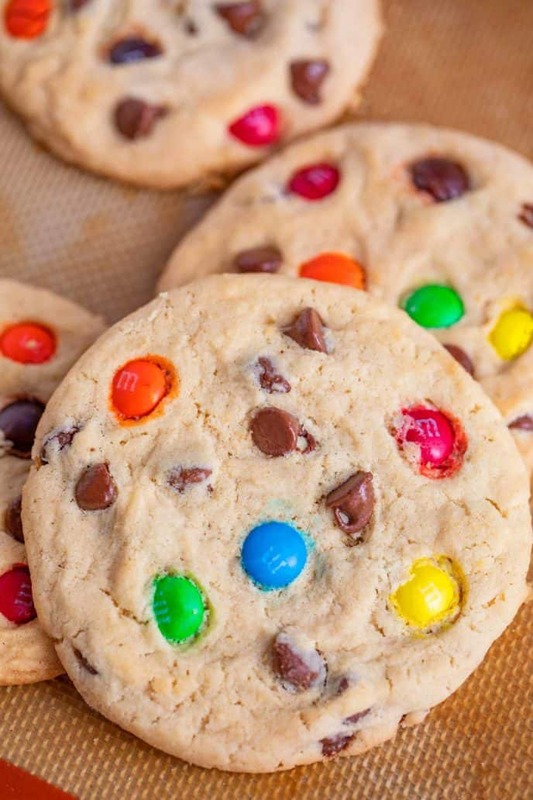 M&M Cookies are soft, chewy, and PERFECT for making ahead of time, made with sweet M&M candies and chocolate chips, and bake in only 10 minutes! We almost always have a plate of chewy cookies on the counter for dessert, and right now we’re working on Peanut Butter Cookies, Chocolate Chip Cookies, and Turtle Cookies! 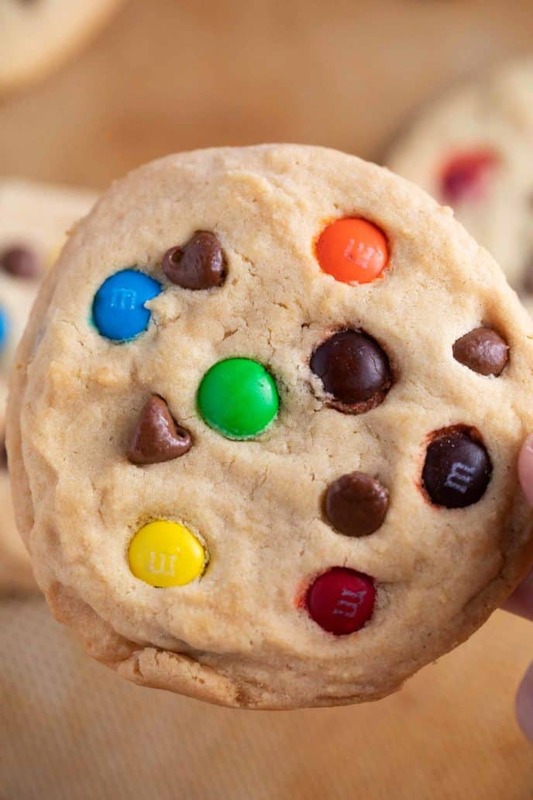 M&M Cookies are have an incredibly soft and chewy texture, with a little bit of crunch from the M&M candies and fudgy chocolate chips. Plus they are a quick and easy dessert, with a total time of 12 minutes to bake! If you are a fan of my chewy chocolate chip cookies, you’ll definitely love this M&Ms version. 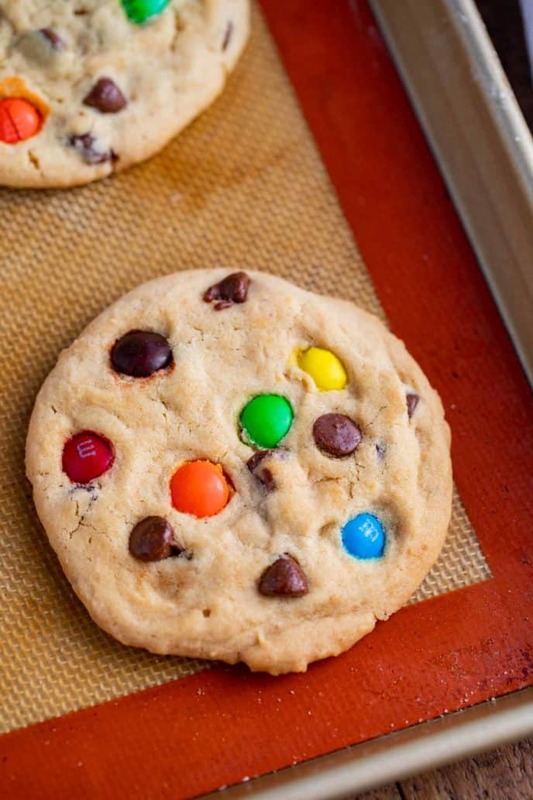 These are my go-to when I want to bake with the kids, because just like my chocolate chip cookies, they love adding the colorful M&Ms to the recipe. I love making these ahead of time and freezing the dough, so I can take them straight from the freezer to a baking sheet for a quick snack when we have unexpected guests. CAN YOU FREEZE M&M COOKIES? This is a great recipe for making ahead of time and freezing. You can place fully baked cookies in an airtight plastic ziplock bag and freeze for 2-3 months. Defrost on the counter for a few hours before eating. 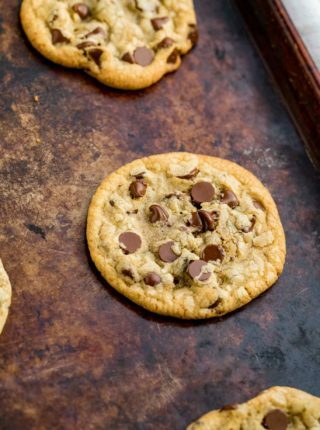 When you’re ready to bake, you can place the frozen cookie dough right onto a baking sheet. Preheat oven to 350 degrees F, and bake for 12-15 minutes. These might take an extra few minutes because they’re starting out frozen. Keep your homemade cookies fresh by storing them in an airtight container at room temperature for about 2 weeks. You can also bake the cookies for 3-5 minutes, just to warm them up and make it feel like they just came out of the oven for the first time. HOW DO YOU MAKE OATMEAL M&M COOKIES? 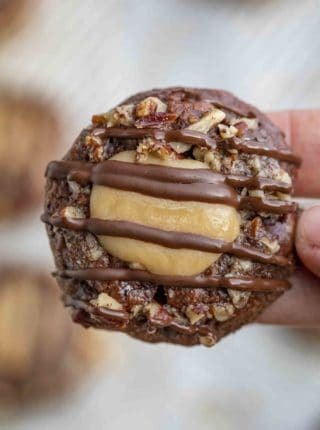 To make this an oatmeal M&M cookies recipe, bring the all purpose flour down to 2 cups, and add 3 cups of quick cooking oats plus 2 teaspoons of cinnamon. Preheat oven to 375 degrees F and bake for 8-10 minutes. You can also try my Super Chewy Oatmeal Raisin M&M Cookies. 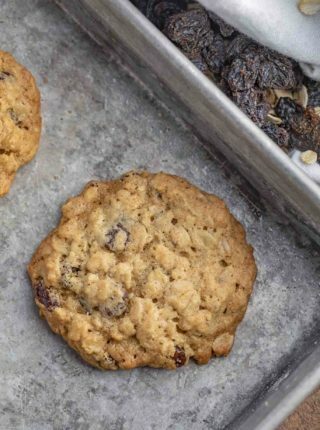 You can use instant oats or rolled outs in oatmeal cookies, depending on how chewy you like your cookies. The rolled oats will have the most texture, while the quick cooking oats will be softer. 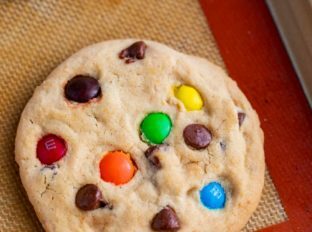 CAN YOU MAKE M&M COOKIES WITHOUT BROWN SUGAR? This recipe calls for refrigerating the dough for an hour, make sure you don’t skip this step. You’re giving the butter in the dough a chance to solidify, and the colder it is, the slower the cookies will drop in the oven when they are baking. This stops the cookies from spreading too much and becoming crispy. Use an ice cream scoop to help make all of the cookies the same size. You can use other candy instead of M&Ms with this recipe. Try peanut butter chips, mini marshmallows, white chocolate chips or dark chocolate chips, butterscotch, or caramels. Or check out my Oatmeal Reese’s Peanut Butter Cookies or Chocolate Chip Cookies. If you don’t have a stand mixer, you can cream the butter and sugar together with an electric hand mixer, or just do it with a bowl and a spatula. 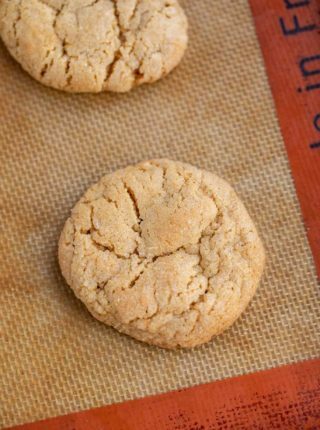 You can make these cookies less chewy and more crunchy by adding a few minutes to the cooking time. Watch them closely to make sure they don’t burn, just look for a deeper golden brown color. Make sure to line your baking sheet with parchment paper, unless your sheet is non-stick, but even then I still line them just in case. If your cookies turn out underbaked but browned on the outside, your oven may not be cooking true to temperature. Try using an oven thermometer to make sure it’s heating right. Once you have your cookies scooped out into balls, place a few M&Ms and chocolate chips decoratively on top before baking. You can replace the vanilla extract in this recipe with other flavors, like almond or peppermint for the holidays. To your stand mixer add the butter, brown sugar and sugar and beat until light and fluffy before adding in the eggs one at a time. Add in the vanilla, flour, baking soda and salt until just barely combined on low speed then fold the m&ms and chocolate chips with a wooden spoon. Refrigerate the dough for an hour then bake 2 tablespoon sized cookie dough balls at 350 degrees for 10-12 minutes. My kids love these! Love that they bake in just 10 minutes! Yep, super quick and easy. These are such a classic — reminds me of grade school! I love a good nostalgic treat! These cookies were a huge hit! I should have made two batches because one was gone in minutes! I’d definitely call that a winner! These really look like the perfect cookies! I need to make these for my kids! Always one of my favorite cookies! Love this recipe. 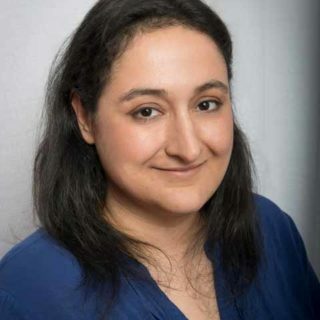 Thanks Amy! You really can’t go wrong with M&Ms.